Time management and goal setting for 2009. How happy were you with 2008? Our mission is to help as many people as possible to improve their time management and goal setting. So we are making this DIY Goal Setting workshop available for free for time management central members. Click here to download the Personal Best Year DIY-Workshop. 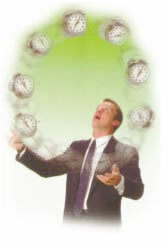 Do you know the precise process to ensure 2009 is a Personal Best year for you? Some of you will be thinking, I’ve done this before or I know how to set goals. Did you set goals for 2008? Did you achieve them? We believe the Personal Best Year process is like a Flight Take-off checklist process Would you like your pilot to say “we won't do the checklist today. I’ve done it before 100s of times. I’ll be OK!!!" In other words you need to go through this process each year to make sure you have a great year. The Goals from the Heart DIY-workshop has been updated and includes new material including aspects of “The Secret” AND hands-on experiential exercises. The time management and goal setting DIY-workshop is a unique and powerful combination of the world’s best goal achieving and life balance approaches. The world best systems have been researched, tested and proven in thousands of coaching and workshop hours over the past 3 years – NOW it is available to YOU for the first time as a DIY workshop.